I jump at any chance to visit a private residential garden, but more often than not they tend to come across as an ostentatious show of wealth rather than a celebration of horticulture. 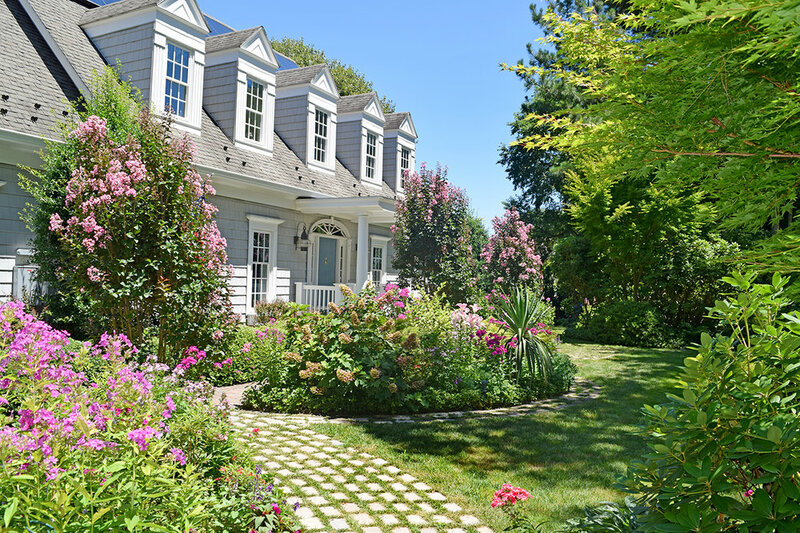 Mill Pond Garden, a meticulously landscaped residence in coastal Delaware manages to subvert the stereotype by transforming a suburban yard into a small-scale botanical garden and natural wildlife habitat. It is generously open to the public almost monthly. I was lucky enough that one of their open days coincided with a weeklong family vacation at the nearby beaches. On a small parcel of semi-wooded land, the area’s unruly shrubs have been cut back to create a rustic woodland garden walk. Just beyond the black iron gates, hydrangea bushes with flower clusters in a deep shade of blue surround a small koi pond and gazebo. From here a path winds through trees and more hydrangeas, past gigantic lilies jutting out at odd angles, and along a decorative ground cover of green caladium and strawberry begonia. This enchanting section, with its loose plantings of colorful flowers and vibrant greens set the overall unpretentious tone of the garden. The front yard has been expertly reworked into a interlocking assortment of flower beds. I was charmed by their scalloped stone pathways with grass growing in between the pavers. Older trees rise out of islands of rhododendron, azalea, and other large green and flowering shrubs. A cloud of puffy, pale hydrangea tumbles over a handsome white fence backed by a dramatic spray of crepe myrtle blossoms. The whole scene was a tempting advertisement for the gardens beyond. Sprays of color pop up in all directions, like the vibrant gold yellow of the night-blooming daylilies near the driveway or the deep fuschia phlox around the main entrance, set against the deep green of boxwood hedges. Curving pathways and flowerbeds help to establish a sense of flow and movement around the property with no real distinction between the front, side, or back of the home. Yet it is only from the back that a panoramic view of Red Mill Pond creates a romantic backdrop for the garden, vastly accentuating the overall wow factor. >> Visit Mill Pond Garden here!